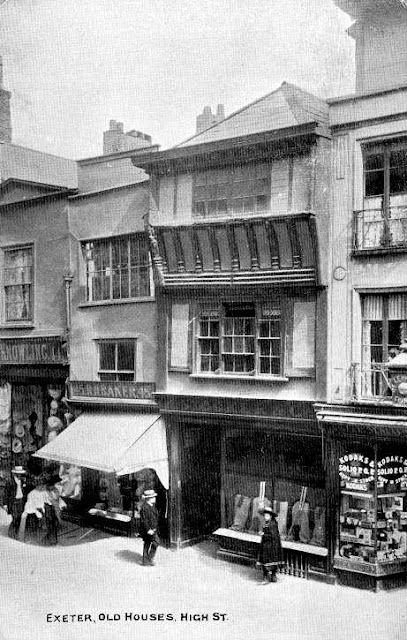 These two properties are the oldest surviving domestic houses on Exeter's High Street and, despite their radically different appearance, were built as a matching pair probably around 1530 or 1540. No. 46 especially (to the left in the photograph left) is an important survival for a number of reasons and the following post will focus primarily on No. 46, although much of what is written would've applied equally to No. 47 had its front elevation not been replaced in the 19th century. The surviving Tudor timber facade of No. 46, despite much restoration, is believed to be the oldest surviving carved domestic street frontage in Devon. It is three storeys high, and although the shop front is modern at least it is subtle and respects the rest of the facade. The windows are also all 20th century in origin too but they are reasonably accurate reproductions of what was probably installed when the property was first constructed. In the 19th century the first-floor window had been replaced with three sash windows, the second-floor window with two square 9-light windows. See photograph below right). The photograph right shows No. 46 c1900, prior to the restoration of the woodwork and the replacement of the altered windows. Nos. 43 and 44, also from the 1500s, are visible to the left. The second floor timbering is very interesting as it features unusual coving beneath the window divided vertically by uprights carved with a spiral design, the same design appearing horizontally beneath the coving. 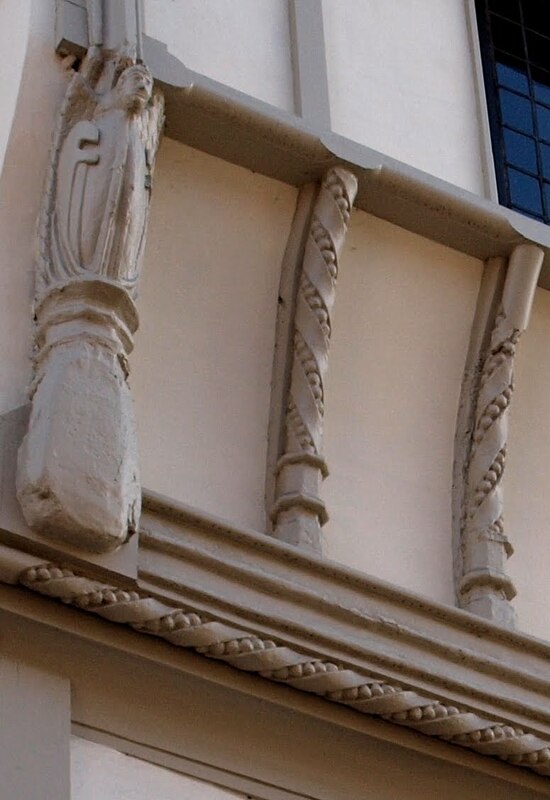 The coving terminates with carved brackets in the form of angel-like figures (the right-hand bracket is a modern addition to replace the lost original). At the top of the facade is a modillion cornice, added in the 18th century, behind which is the shallow hipped slate roof hardly visible from the street. 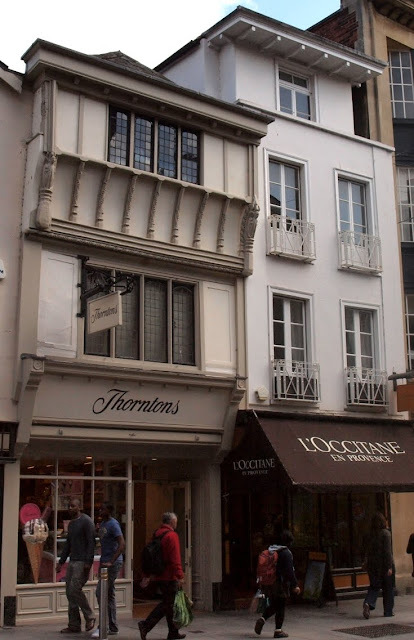 There was probably a shallow gable originally which the modillion cornice replaced. Another unusual aspect of the houses is the fact that, when first built, they were constructed of nothing but timber-framing. Most of the timber-frame houses built at this period in Exeter, and throughout Devon, had at least a party wall built of stone, an example of which is still visible to the side of No. 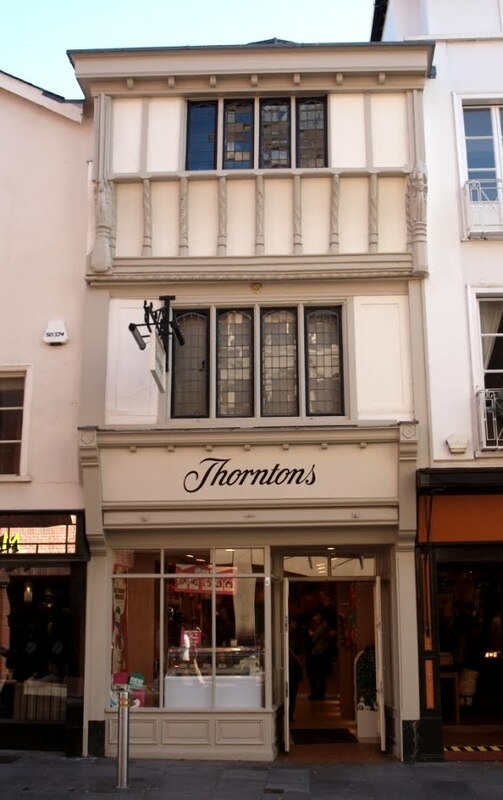 41 High Street and into which were set fireplaces, chimneys and perhaps a garderobe, as well as acting as a firewall in the event of a serious fire. Nos. 46 and 47 had no such wall, the fireplaces and chimneys rising vertically in an isolated stack where the two buildings joined. This lack of a mixed construction technique makes No. 46 a unique survival of its type in the entire county. The photograph left shows a detail from the carved woodwork of the second floor coving of No. 46, including one of the sculpted brackets. According to the Royal Albert Memorial Museum's website, the houses took the following form: they were both two rooms deep, with a shop on the ground floor behind which was a workshop or storage area. The finest room on the first floor would've been the fore hall, the room that overlooked the High Street, above which were the bed chambers. It's thought that the windows originally extended across the entire width of the elevation to let in the maximum amount of light as well as being a display of wealth in their own right. There would've been a back block connected to the main house via an open gallery which probably functioned as a kitchen. This distinctive arrangement of a gallery with a back block was once relatively common in Exeter but few very examples now survive. The historically important No. 38 North Street was demolished in 1972. An unusual two-storied gallery survives at No. 18 North Street although the back block was destroyed by a bomb in 1942. The first-floor gallery which once connected No. 47 to its back block still survives, complete with its original balusters. Another interesting aspect of No. 46 is the suggestion that the original entrance into the house was probably through the side wall, now obstructed by No. 45 High Street. No. 45 dates to c1600 and prior to its construction it was possible to walk through the High Street and into the Cathedral Yard via a narrow lane called Lamb Alley. The eastern side wall of No. 46 still has remains of external trefoil decoration and a blocked window, proving that it was once exposed to view. In the early 19th century the facade of No. 47 was replaced, totally disguising the building's 16th century origins. An extra storey was added, set back from the main facade, and large casement windows were added along with some attractive Regency, Greek-style ironwork balconies. Both properties still contain internal features of interest, e.g. No. 46 has a late-17th staircase. No. 47 is a Grade II listed building while No. 46 received Grade II* status, the star reflecting its preserved 16th century facade.